Archives of Eaton Bray News for January 2009. Do you know the difference between a rose and a radish? Would you like to show others your pride and joy? Would you enjoy meeting other, like minded people, whilst raising money for the British Red Cross Bedfordshire? If so British Red Cross need you and your garden. British Red Cross Bedfordshire are looking for new gardens to take part in our Open Gardens 2009 scheme. Gardens do not have to be huge and they would only be open for half a day in the summer. Alternatively, if you would like to help at other British Red Cross Open Gardens within Bedfordshire in 2009, please let me know. This is a great way to make new friends at the same time as raising valuable funds for the British Red Cross. Thanks to your help, the recycling rate across Bedfordshire has increased from 5% in 2000/01 to 40% in 2008/09. We have some way to go to reach our next target of 50% recycling by 2011 but we know that with so many dedicated recyclers we can all make a difference by recycling more and more often. Together we can do it! To help, we are pleased to announce that we are now adding more items to the recycling collection scheme. 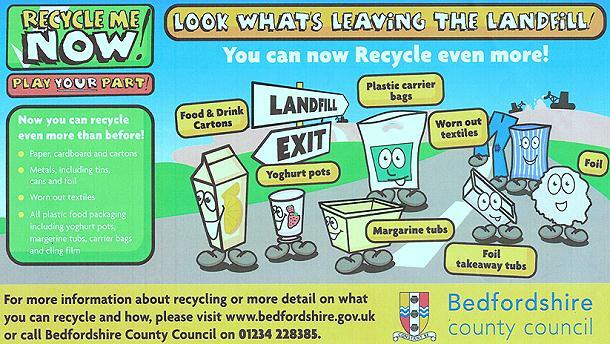 Starting on the 12th January 2009 residents in Bedfordshire will be able to add the new items to their existing collection (see below). You won't have to separate the recycling or do anything other than add these new items to your current collection bin or bag. EATON BRAY PARISH COUNCIL hereby invite you to attend a Public Meeting to find out local opinion on installing a Skatepark & Youth Meeting Point at School Lane Recreation Ground. The meeting is to take place on Thursday 12th February 2009 at The Coffee Tavern from 7:30pm. Reader Comments: To have your say via the website, see the Skatepark & Youth Meeting Point topic on the Parish Council Forum. A match with everything - high tempo, all action, tension and end to end football. It took an unlucky own goal after fifteen minutes to give Dunstable the lead and then Lions had to dig deep to get a well deserved equaliser a minute before half time. The goal came after some great movement and passing from the Lions to give George Oliver the opportunity to slot in a great goal. The second half continued at the same pace with both teams creating scoring chances, and after three minutes Jack Quigley scored from a really tight angle to put the Lions in the lead for the first time. Soon after Lions had a penalty awarded against them. Toby Higgs in goal, who had been having a great match, was in the hot seat and he pulled off not one but two great saves, the first from the penalty spot and the second from the rebound from his first save. The match continued in true cup fashion with both teams giving their all. Oliver played a true captains role today and lead the team to a well deserved victory. Lions can now look forward to a well deserved place in the final. Well done and thank you to both teams for an entertaining, fair and exciting match. Team: Roe, Quigley, Nevitt, Oliver, Barbato, Mines, Higgs, Giblin, Shrewder. Lions kicked off the new year with their maiden win of the season, overcoming a tenacious Dunstable side. Goalkeeper Dan Kennel made a series of stunning stops to deny the visitors, while midfielders Chris McGee and Charlie Nevitt linked up to establish a continued goal threat with pinpoint passing and linking runs. Sean Woodhouse was happy to entertain fans with his slicing runs at goal which looked set to put Lions ahead before the break. It was not until the second half though that their resolve finally paid off, a corner from Adam Bradley sailing first in front of goalmouth and then, on the rebound, bending in to secure a narrow lead. Not ready to capitulate, Dunstable countered with impressive resolve, and thanks only to solid defensive work from Aarin Johnson, Ben Roberts and James Pratt were they able to fend off the efforts of their opponents. Mason Ashby posed his usual problems to the Dunstable attack drives, needling the ball away from the forwards and then establishing intelligent passes to maintain possession, while Tom Horner showed real discipline to drive play forwards to active front men Will Juster and sub Will Petherbridge. The return of Dominic Ryan, who has lost none of his skill and determination, also buoyed the team. This was the Lions first match for six weeks after the Christmas break and then the cold weather. You would never have known, the Lions dominated from start to finish and only two opportunities against the run of play stopped Lions from what would have been a well deserved win. From the start Nancy Oliver in goal with defenders Katy Thiel and Eden Scott were solid, our midfield of Darcy Ashby and Emily Hudson were in total control and up front Megan Viljoen and GoM Hattie French, were causing all sorts of problems for Kempston. The Lions' subs Bethan Woolsey, Shannon Byrne and Elsa Kirkwood all had an impact when they were brought on. Five minutes into the second half Kempston scored after an unlucky bounce and the Lions were one down. It was only ten minutes later after a move started in defence by Thiel and then Ashby in midfield who made a great run and set up French who took her chance well to send the ball into the back of the net, the Lions were back on even terms. With less than five minutes remaining, Lions conceded another goal. As always, Lions responded the only way they knew how by pushing forward and attacking strongly, and with four or five good chances in the last few minutes of the game, only the post and two good saves stopped the Lions scoring again. Team: Oliver, Thiel, Scott, Ashby, Hudson, French, Viljoen, Woolsey, Kirkwood, Byrne. The next Parish Council meeting to be held at the Coffee Tavern on Monday 2nd February 2009 at 7.30pm. Items for the February agenda to be requested no later than Tuesday 20th January 2009. Eaton Bray under 5's mum's and toddlers will reopen on 21 January as "Cheeky Monkeys". All are welcome, come along and make new friends. If you prefer to telephone first, contact Sue Fox on 01525 222387. Cheeky Monkeys is held Wednesdays during term time, 1.00-2.45pm, Eaton Bray Village Hall. You are viewing the January 2009 archive.